A picture can be a great start for a conversation when it is hard to get students talking in the target language. In my present school, we prepare grade 9 and 10 for the IGCSE exams and one part of the exam is about students having to converse with the teachers about different topics they have previously learned. As a matter of fact I do find that the topics are repeating themselves year after year: school routine, home life, self, family and personal relationships … And after a while students get bored about talking about the same stuff over and over again! I do find myself lacking of imagination to differ my lessons about the same topics we teach in grade 6 and in grade 9! In that way pictures can help spice up the lessons. I already mentioned the wonderful website Spanish Playground which has a series of posts entitled Learn Spanish with pictures. Each post includes a photograph with different activities to help students master the vocabulary and gain confidence with the language. 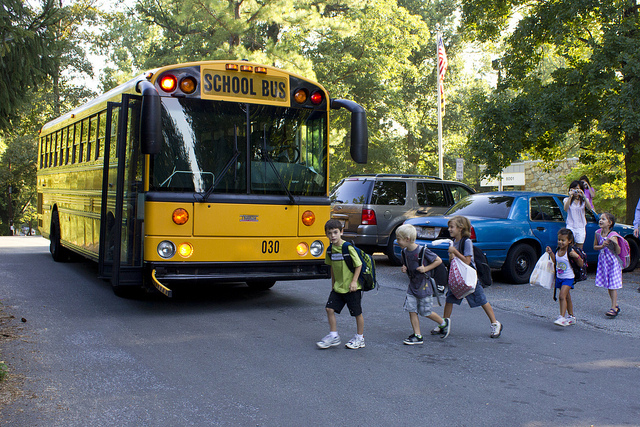 As an example, I am going to use the first day of school photograph to talk about school routine. The first activity involves the teacher describing the photo by pointing at the objects and people and using gestures, facial expressions and actions to help students understand what the words mean. Once students understand the key words, the teachers can then ask questions from Choose the answer (2) and Pointing and counting (3). Then the teacher can move on to ask questions in Yes and No (4) to practice more of the vocabulary used in the description. When students are comfortable enough with the Spanish words to produce them easily, the teacher can then include the questions in Say a little more (5). Finally the questions in What about you? (6) give the students a chance to talk about themselves. I find this is perfect to gradually make students have a conversation. I have also created a board on my Pinterest account entitled Pictures / paintings / photos where I pin anything which I find interesting, funny, cultural or which relates to a topic. I contemplate showing a picture from this board randomly to students and start a conversation from there. This could be a good starter or end of a lesson. What do you think? How do you use pictures with your students? < Another story script in Spanish: ¡No es aceptable!